Back on Tuesday, I blogged about alleged “cheesecake” provocateuse Alice Lon, whose leg-crossing cost her the job of Lawrence Welk Show “champagne girl.” Well, the history of the term cheesecake isn’t the story I can tell about a woman who got fired for sexiness that by today’s standards qualifies as barely above the schoolmarm level. 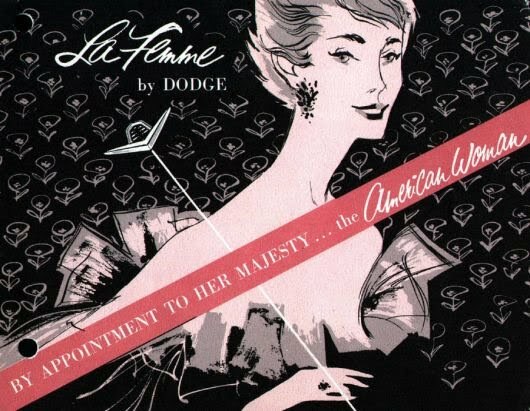 Before the end of Lon’s tenure as Welk’s right-hand gal, she appeared in a print advertisement for the Dodge La Femme, an automobile introduced by the Chrysler Corporation in 1955 to appeal to female motorists, who were just then beginning to care about those fancy four-wheeled boxes that their husbands had been driving to work and then to their mistresses’ houses on the edge of town. 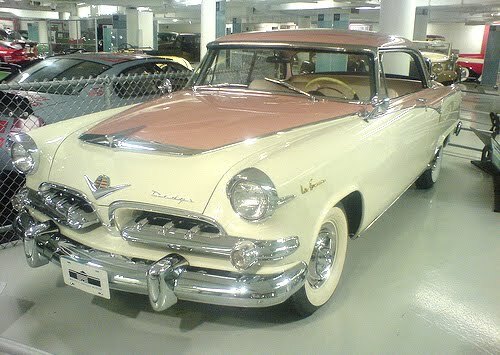 The original La Femme is actually quite elegant — more so that the Mary Kay-mobile you may be picturing as you read this. No joke. I mean, this sounds like something that even Betty Draper would turn her nose up at, but the real kicker here is that the La Femme concept seemed at least promising enough that a 1656 edition was produced. It was further femmed-up. Instead of the Heather Rose and Sapphire White paint combo, the La Femme 2.0 sported Misty Orchid and Regal Orchid seat coverings that resembled purple loop-pile carpeting. 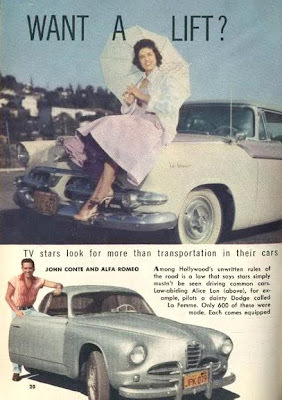 This version of the car was the last, and it faded into obscurity, not unlike Alice Lon after she got canned. 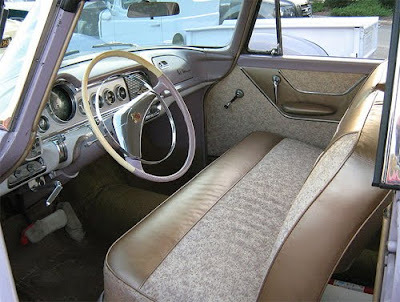 I can only hope that at least one man at some point was stranded with only a La Femme to drive to safety. Ha ha. Mortification. 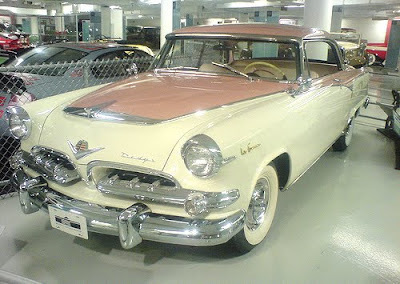 A final note: At last, a worse idea for a car than the Intelligent Whale.